The engaging Sing with Me Step Stool promotes healthy hygiene with fun tunes that cue your child when to start and stop brushing teeth or washing hands. Your child will be delighted by the smiling character holding a toothbrush in one hand and a bar of soap in the other. The step stool plays a 2-minute song when you press the toothbrush and a 30-second song when you press the bar of soap. Encouraging your child to brush his or her teeth or wash hands during the entire song promotes a lifetime of healthy habits. The step stool features a wide, non-skid surface to keep your toddler's feet in place. With durable materials and sturdy design, the step stool is safe and stable. It's portable, too, so you can easily toss it in the trunk of a car to take with you anywhere you go. 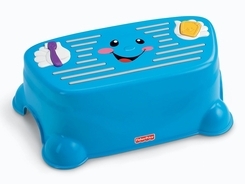 The Fisher-Price Sing with Me Step Stool operates with three AA batteries (not included). Founded in 1930, Fisher-Price creates products that makes lives easier for parents and toys that foster a child's imagination. Instantly recognizable throughout the world as a leader in infant and preschool products, Fisher-Price focuses on delivering stimulating products for both children and babies. With a trove full of classic, tried-and-true products in their arsenal, the company continues to design and create new developmental toys and baby products. Fisher-Price Sing With Me Step Stool and instruction manual.